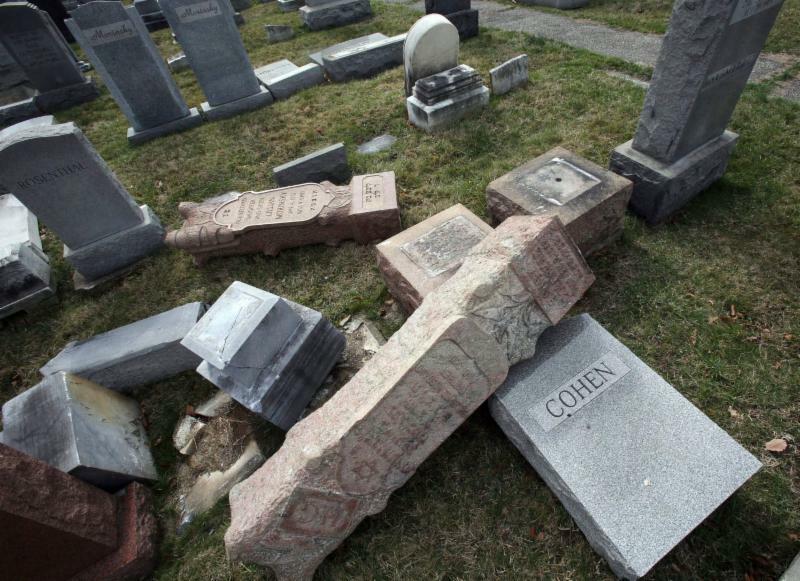 Photo is of Jewish tombstones that were vandalized last year in Philadelphia. A recent opinion article in the New York Times entitled “Anti-Semitism Is Rising. Why Aren’t Jews Speaking Up?” in the New York Times has the Jewish community in a buzz. Two involved members of the Birmingham Jewish community immediately sent it to us at the Birmingham Jewish Federation wanting to be sure we saw it. According to the Anti-Defamation League, anti-Semitic incidents have increased by 57% over the past year. New York Times journalist Jonathan Weisman, who wrote the controversial article, cites this statistic and goes on to contend that this represents a crisis the Jewish community needs to get ahead of and, he feels, that the organized Jewish community is not being proactive in addressing growing anti-Semitism. “If the vinyl banners proclaiming ‘Remember Darfur’ that once graced the front of many American synagogues could give way in a wave to ‘We Stand With Israel,’ why can’t they now give way en masse to ‘We Stand Against Hate’?” he asks. Sommer goes on to say that Jews on the left and right have become finger pointers. There is no prevailing center or moderate perspective, Sommer argues and cites the American Jewish Committee and Jewish Federation of North America’s effort to create a unified, balanced approach towards these issues. Both articles have important points and we at the Birmingham Jewish Federation have often found ourselves toeing the fine line between speaking out against something that many feel is wrong and presenting ourselves as a partisan organization. The important take away from these articles is to remember that while the Jewish community has vastly different opinions, our love for a good argument (I mean, discussion…) unites us. We can each have our own opinion, but we will always have something in common — our privilege of being part of the Jewish community. And, while we may be living in an era where we distinguish ourselves as Jews from one another based on politics, our views on Israel, and/or our approach to religious worship, for the anti-Semite those distinctions do not matter. Click for the article from the New York Times. Click for the article from Haaretz.